Last week we told you about a giant paper Samus created by Flickr user IAmThatOneGuy, and we decided that we wanted to learn more about how it was created. 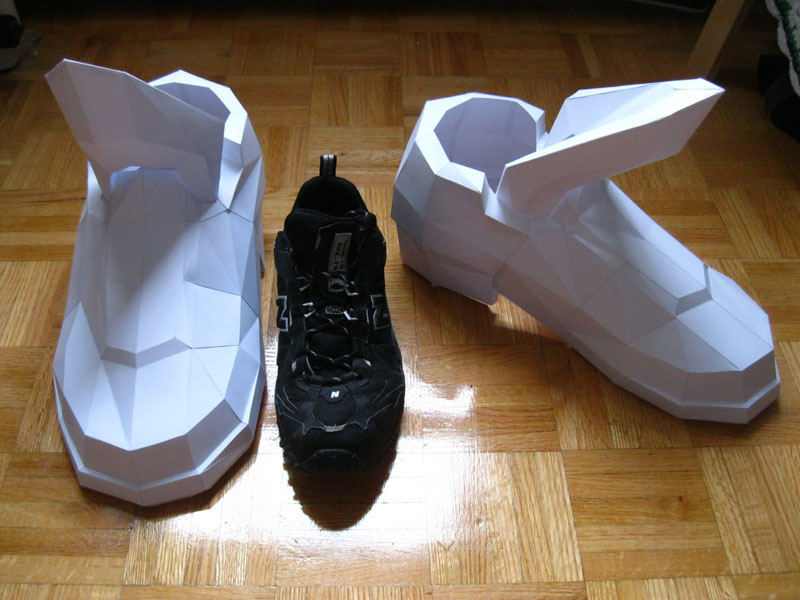 We reached out to the paper artist and learned more about him and his unique project. Nintendo Life: First, please introduce yourself and your creation. Matthew R Green: My name is Matthew R. Green. 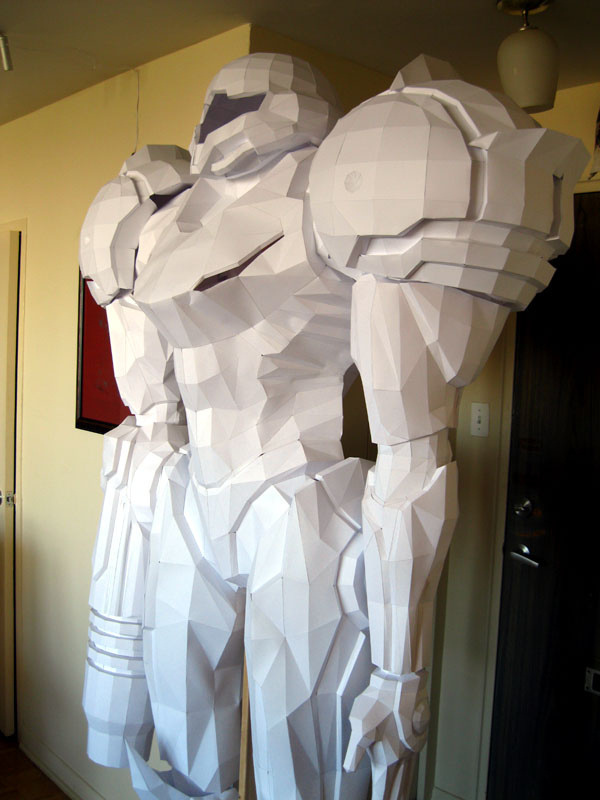 I'm a Ph.D. student in Toronto who just happened to build a 6'10" Samus Aran out of paper in my spare time. 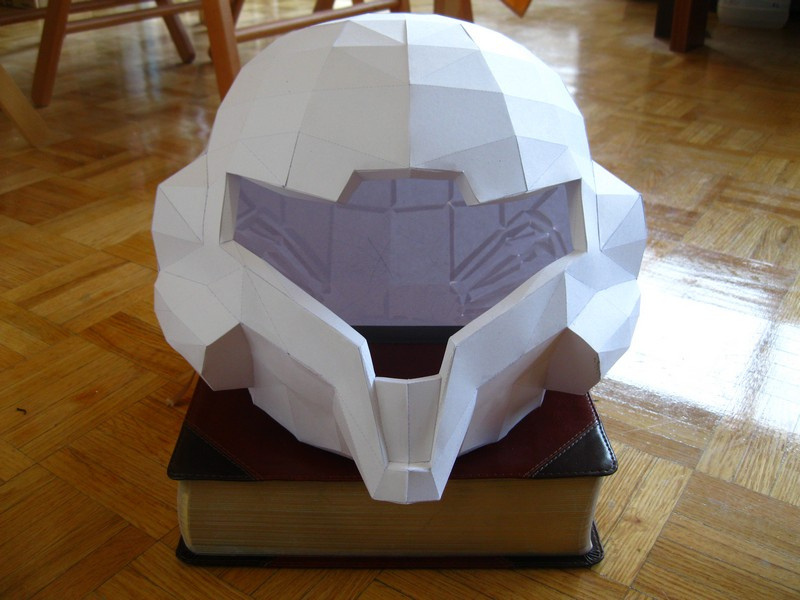 NL: From start to finish, how long did it take to put the paper Samus together? MG: Overall, about seven months. It was a lot of stop and go — I’d ignore it for a couple weeks, then devote a Saturday to finishing off an arm, then a few evenings here and there to the torso. Then back to ignoring it for a while. It became something to do to fill time while I was avoiding studying and it was too cold outside to work on other projects. NL: What was the hardest part? MG: The hardest part was trying to figure out a support structure. I was hoping it wouldn’t need one, but at about 75% finished, it became clear I had no choice. Then I was hoping to be able to keep it all internal, but by that time, it was too far assembled to get something workable inside the structure without slicing her open, which I didn't want to do. My first attempt was a flop, and for a while, the weight of the arm cannon, which is absurdly heavy for a bunch of paper, was twisting her lower back completely out of shape. I had to build something that worked quickly before she destroyed herself. Had I thought about this from the beginning, it would have been a much simpler issue. Alas, hindsight is 20/20 and all that. NL: The big question: why undertake such a huge project as this? MG: A lot of people have asked me that question, and I think I've finally come up with an answer: to see if I could. 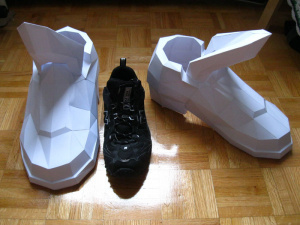 At first, I was curious if you could scale the polygon models to life-sized. Amused by the fact that you could, I printed out the helmet design on cardstock and started putting it together. Then I just kept going. It seemed silly to stop in the middle, so I had to finish it. NL: Why did you choose Samus's Varia Suit from Metroid Prime 2: Echoes? MG: Mostly because that's the model I happened to be able to get a hold of. I could have chosen the light or dark suits as well, but I simply think the original looks better. NL: Did you ever consider using colour? MG: I'd considered it, but ink is expensive, and this would have taken a pretty significant amount. I've thought about painting it as well, but I'm not sure it would look as good as I'd like, and I'm concerned about the added weight as well. In some ways, there's actually something pure about it being plain white, so it will probably stay that way. NL: What are you going to do with the sculpture now? MG: The joy was really in building it more than in having it, so I was hoping to find it a new home. Turns out a local gallery owner wants to make it part of an art show in a few months. I didn't see that one coming. NL: Any plans to do something similar for a different suit or Nintendo character? MG: Not at the moment. We'll see if the muse strikes. I have had some suggestions to create a morph ball to go along with it. There's admittedly something appealing about that. NL: You're obviously a big Metroid fan — what do you hope for from the next entry in the series? MG: While I do really like the Metroid series, I'm not much of a contemporary console gamer. I mostly dabble in older or simpler games. The most recent thing I've played on a console is probably Metroid Prime 2, so I'm not terribly familiar with where things have gone since then. To really say what I'd hope for from the future, I'd have to have a DS, a Wii and some time on my hands to first find out what happened in the past. We'd like to thank Matthew for giving us his time, and also for access to the images in this article. That's great! Makes me want to do something similar eventually. I think this is the Samus I have been playing as in Metroid Fusion (3DS Ambassador version). Everything that touches me seems to take away like half my hits! I guess Paper suit Samus won't do well under water... or in rain for that matter. It will transform into Soggy suit Samus. @mattatron Comment of the day! It looks very nice... but I'm not sure where I would put the thing. Longtime reader who just registered to say that that clever subtitle made my day! @zipmon Aran is a type of sweater, right? I didn't know that until I Googled the tagline. paper mario, and now paper samus. Keep that thing right in front of your TV. Watch as the ing run in fear of a pure white Samus waiting to gun them down. Anyway, joking aside, good job! I recently started playing Metroid (around 7-8 months ago) and really liked Prime 2. Your details were excellent. It would be cool if a group of people like you recreated scenes from games in color and all as papercraft. Imagine a full papercraft scene of Smaus and the Baby Metroid. To activate Morph Ball mode, simply crumple her up. That'll go into my room for display only. I think i'd just make the helmet to wear around. @iamthatoneguy If you ever decide to create another model again, i'd want to see you make Luigi. NTELLIGENTMAN -> In your list of weaknesses, you forgot earth and heart. Especially heart, the crappiest element of them all. @SomeBitTripFan So what's stopping you?